This show brings together 20 artists from a range of disciplines including product design, interactive media, graphic design, photography and illustration. 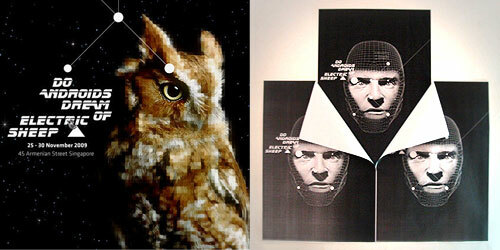 Curated by Steve Lawler aka Mojoko, the show exhibits thru December 1st, 2009. Most of the artwork are available for purchase. After the show ends, there are tentative plans to move remaining exhibits to The Loft @ Haji Lane (TBC) and if you are interested in purchasing any of the artwork shown, email Steve at steve@kult.com.sg for inquiries. A deceptively stark display gallery which belies the solitary mood of the classic epic (or rather the loneliness of Deckard, IMHO) heightened by the color-tinged lit fluorescent tubes at corners, and predominately at Mystic Vintage fashion-skeleton installation (peep slideshow at bottom of post), lends a slight cackle of electricity in the air, well, as the very least my own anticipation for the show (and of course, lurve for the Ridley Scott-classic). I would hazard to say having the movie soundtrack by Vangelis subtly pumped out would be fab (but yes, perhaps a tad overkill) ~ but instead a television playing the movie DVD at the window area at the far end of the gallery works effectively in conjuring up the mood for sum Replicant-lurve (and there will never be a Replicant-Rachael like Sean Young). Now, enough of my cyber-twaddling, onwards for the artwork and installations on display! 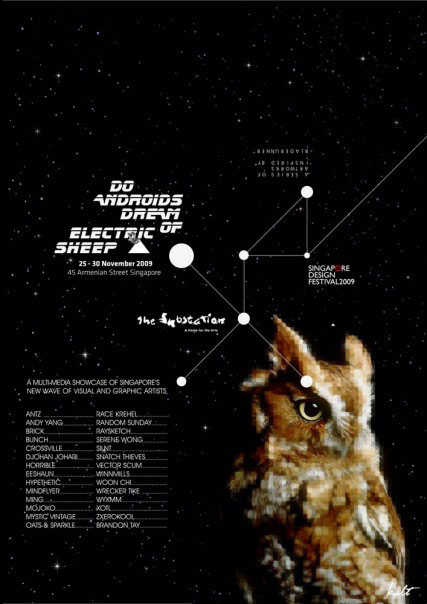 Video Art piece by Brandon Tay, made for the ▲ Do Androids Dream of Electric Sheep? ▲ ~ an exhibition based on the film Blade Runner [blogged] ~ currently on show at The Substation, Singapore (exhibits thru December 1st / tagged). Brandon-adds: "My piece is based on the VK test in the film, and themes of genetic memory." almost-famous.tv covers the Blade Runner-inspired ▲ Do Androids Dream of Electric Sheep? ▲ group art show @ Substation (circa November / TRE-Coverage) ~ featuring soundbytes from artists Winne Goh and Jonathan Leong aka ZXEROKOOL. 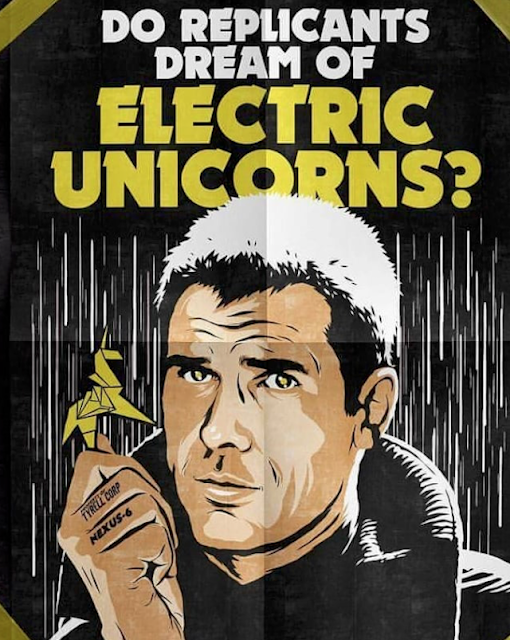 PRESS: "See how 20 Singapore artists have been inspired by the movie Bladerunner. The seminal movie has inspired and influenced artists since its release in 1982 and continues to be a classic cult film crossing several genres. This show brings together artists from a range of disciplines including product design, interactive media, graphic design, photography and illustration. This group will be creating a cross between a pop-up shop and an exhibition where all sorts of work inspired by the movie will be up for sale at “The Substation” this coming November. Witness some of these inspirations in a series of 2-D to 3-D artworks all created for this specific showcase. Artwork that will be available include limited edition jewellery pieces and design objects from Singapore’s most exciting new wave of underground and emerging artists. Sound designers will create tracks specifically for the event, There will be customized trainers, Sunglasses, graphic prints and other pieces which are not so easily categorized … These pieces will be for sale in exclusive limited runs."